Deputy Defense Minister slams IDF commission to examine reducing prison terms of terrorists sentenced to life in prison. Defense Minister Avigdor Liberman expressed his opposition to the committee that the IDF established to examine the possibility of reducing the sentences of terrorists sentenced to life in prison. "As long as I am the defense minister, no terrorist's sentence will be shortened to even one hour," he said. 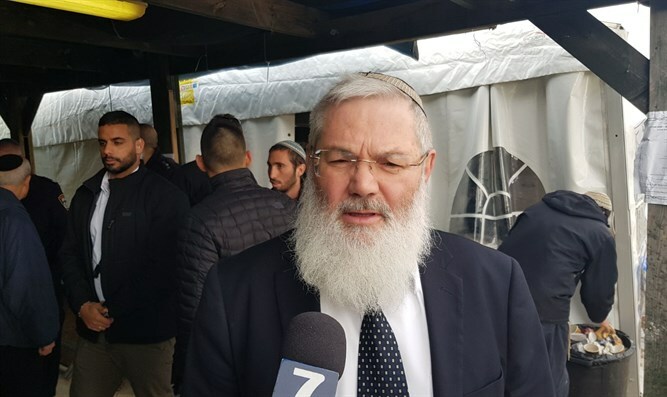 In an interview with Arutz Sheva, Deputy Defense Minister MK Eli Ben-Dahan related to the establishment of the committee by the IDF "against the background of comments made during a hearing on the petition to the High Court of Justice." "The defense minister is right, it's folly. There's no logic in agreeing to such a distorted idea," says the deputy minister. "Are they like any ordinary criminal?" "The comparison with criminal acts is not understandable. Why are we punishing those who have been sentenced to life imprisonment? But there is a complete process in which life sentences can be reduced under certain conditions, but it must be remembered that the murder committed by the terrorists is not a private murder, but rather a national murder. The goal is to expel us from the country. It is not just a specific act of murder, [but acts like] the murder of the Fogel family have the goal of uprooting us from the settlement of Itamar and from all over the country and to return to the countries from which we come." "As soon as the first crack of the establishment of a committee begins, the nature of the world is that the crack will expand, and therefore, as soon as the first crack of a committee begins. We must not open this crack," Ben-Dahan said. "I say this statement to the Israeli legal system, 'With all due respect, the status that murderers receive is unparalleled anywhere in the world,'" he said, adding that "It is impossible to agree to these petitions and to the position that the legal system gives them, in our judicial system, with such respect for every request. This is against all logic. Democracy must defend itself. Democracy does not have to commit suicide and we must be willing to do anything for democracy"
"I believe that the defense minister will be able to pass on his instructions through the regular and orderly system of command, and that at some point the IDF feels that it has been coerced by the High Court of Justice, but even the High Court must understand that there are unforgivable crimes. Just as everyone is talking about the fact that we should not talk about shortening the sentence of the prime minister's murderer, so also crimes of this kind have no place to think about reducing the punishment. Perhaps, we asked the Deputy Minister, as one who believes in the duty to compare the law on both sides of the so-called Green Line as part of the aspiration to impose sovereignty, one might have expected that he would be surprised and support such a possibility as part of the comparison between the small judicial mechanisms in Israel and the judicial mechanisms in Judea and Samaria. "This is supposed to be the last law to talk about comparing it on both sides of the Green Line, and in the past year I have been comparing many laws between Judea and Samaria to the rest of the country, and when we finish all these laws and compare all the laws, then we can talk about this law," he said.